Colin Ware in his Information Visualization book outlines the key principles for a wide range of applications and designs, providing designers with the tools to create visualizations of improved clarity, and persuasiveness. This book teaches you the most important thing about design and symbology; it explains ‘why’ certain types of designs resonate with most people, and why others don’t. Essentially this gives you a window into the human brain and the eye-brain perception system. Visualizations are an increasingly important part of cognitive systems. Visual displays provide the highest bandwidth channel from the computer to the human. Indeed, we acquire more information through vision than through all of the other senses combined. The 20 billion or so neurons of the brain devoted to analyzing visual information provide a pattern-finding mechanism that is a fundamental component in much of our cognitive activity. Improving cognitive systems often means optimizing the search for data and making it easier to see important patterns. The process of data visualization includes four basic stages, combined in a number of feedback loops. The collection and storage of data. A pre-processing stage designed to transform the data into something that is easier to manipulate. Mapping from the selected data to a visual representation, which is accomplished through computer algorithms that produce an image on the screen. The human perceptual and cognitive system (the perceiver). Applied science of visualization is based on the idea that the value of a good visualization is that it lets us see patterns in data and therefore the science of pattern perception can provide a basis for design decisions. Model of Perceptual Processing Perception is broadly divided into a three-stage model. Stage 1: Information is processed in parallel to extract basic features of the environment. Serving as the basis for understanding the visual salience of elements in displays. Stage 2: Active processes of pattern perception pull out structures and segment the visual scene into regions of different color, texture, and motion patterns. Different pathways for object recognition and visually guided hand motion. Stage 3: The information is reduced to only a few objects held in visual working memory by active mechanisms of attention to form the basis of visual thinking. Bertin J suggested that there are two fundamental forms of data: data values and data structures. A similar idea is to divide data into entities and relationships. Entities are the objects we wish to visualize; relations define the structures and patterns that relate entities to one another. Sometimes the relationships are provided explicitly; sometimes discovering relationships is the very purpose of visualization. Entities are generally the objects of interest. People can be entities; hurricanes can be entities. Both fish and fishponds can be entities. A group of things can be considered a single entity if it is convenient—for example, a school of fish. Relationships form the structures that relate entities. There can be many kinds of relationships. A wheel has a “part-of” relationship to a car. Relationships can be structural and physical, as in defining the way a house is made of its many component parts, or they can be conceptual, as in defining the relationship between a store and its customers. Color is extremely useful in data visualization. Color helps us break camouflage. Some things differ visually from their surroundings only by their color. If we have color vision, we can easily see the cherries hidden in the leaves. If we do not, this becomes much harder. Color also tells us much that is useful about the material properties of objects. The role that color plays ecologically suggests ways that it can be used in the information display. It is useful to think of color as an attribute of an object rather than as its primary characteristic. It is excellent for labeling and categorization, but poor for displaying shape, detail, or spatial layout. Color can be extremely effective when we wish to make it easy for someone to classify visual symbols into separate categories; giving the objects distinctive colors is often the best solution. The technical name for this kind of labeling is nominal information coding. A nominal code does not have to be orderable; it simply must be remembered and recognized. Suppose we are looking at the floor plan of a museum building and we wish to find a coffee shop. We locate the symbol for the coffee shop on the key at the side of the floor plan, and then we carry out a visual search to find that symbol on the plan. A second more complex visual thinking process will be needed to find a route from where we are currently to the location of our coffee. Step 1. A visual query is formulated in the mind of the person, relating to the problem to be solved. Step 2. A visual search of the display is carried out to find patterns that resolve the query. The visual query can have many different forms, but it always involves reformulating part of the problem so that the solution can be found through a visual pattern search. The visual pattern to be found can range from a symbol of a particular shape or color to an arbitrary complex or subtle visual pattern. In all cases, understanding what makes a pattern easy to find is critical in determining how efficiently the query will be executed, and what makes for efficient search is the central theme of Visual Salience. Design graphic representations of data by taking into account human sensory capabilities in such a way that important data elements and data patterns can be quickly perceived. Important data should be represented by graphical elements that are more visually distinct than those representing less important information. Moving our eyes causes different parts of the visual environment to be imaged on the high-resolution fovea where we can see detail. Eye movements are frequent. For example, as you read this page, your eye is making between two and five jerky movements, called saccades, per second, and each of these movements can be thought of as a basic act of visual search. The typical length of the saccade that people make when using visualizations depends on the design and the size of the display. As a general principle, the visual search will be considerably more efficient for more compact displays because eye movements will be shorter and faster. When an object is moving smoothly in the visual field, the eye has the ability to lock onto it and track it. This is called a smooth-pursuit eye movement. When an object moves toward us, our eyes converge. When it moves away, they diverge. Convergent movements can be either saccadic or smooth. Pre-attentive Processing and Ease of Search Psychophysics is the study of human responses to physically defined stimuli. There have been many experiments in which human observers are asked if a particular shape appears in a pattern of other shapes that are flashed briefly in front of their eyes. These studies have led to the concept of pre-attentive processing that is central to how we understand the visual distinctiveness. It is important in displaying information, it is often useful to be able to show things “at a glance.” If you want people to be able to instantaneously identify some mark on a map as being of type A, it should be differentiated from all other marks in a pre-attentive way. Orientation, size, basic shape, convexity, concavity, and an added box around an object are all pre-attentively processed. The features that are pre-attentively processed can be organized into a number of categories based on form, color, motion, and spatial position. In most of these instances, the target is different from the surrounding non-targets in terms of the basic channels introduced earlier. Visualization is mostly about seeing patterns in data, and this means that seeing if a particular variable is relatively larger or smaller than another is what is critical, rather than reading an absolute quantity. This is a good thing because the kinds of representation we have been discussing do not work well for representing quantities. Generally, only three to five distinct values can be reliably read using simple graphical variables such as color, size, or lightness. This means that glyphs using simple mappings are unsuitable for presenting data where values must be read from a display. For glyphs to be seen rapidly, they must stand out clearly from all other objects in their near vicinity on at least one coding dimension. In a display of large symbols, a small symbol will stand out. In a display of blue, green, and gray symbols, a red symbol will stand out. Because only simple basic visual properties guide the visual search, glyphs and symbols that are distinctive in terms of more complex combinations of features cannot be easily found. The first serious attempt to understand pattern perception was undertaken by a group of German psychologists who, in 1912, founded what is known as the Gestalt school of psychology. The word Gestalt simply means “pattern” in German. The work of the Gestalt psychologists is still valued today because they provided a clear description of many basic perceptual phenomena. They produced a set of Gestalt laws of pattern perception. These are robust rules that describe the way we see patterns in visual displays, and, although the neural mechanisms proposed by these researchers to explain the laws have not withstood the test of time, the laws themselves have proved to be of enduring value. The Gestalt laws easily translate into a set of design principles for information displays. Eight Gestalt laws are discussed here: proximity, similarity, connectedness, continuity, symmetry, closure, relative size, and common fate. A visual query is the formulation of a hypothesis pertaining to a cognitive task that can be resolved by means of the discovery, or lack of discovery, of a visual pattern. The patterns involved in visual problem solving are infinitely diverse: Pathfinding in graphs, quantity estimation, magnitude estimation, trend estimation, cluster identification, correlation identification, outlier detection and characterization, target detection, and identification of structural patterns (e.g., hierarchy in a network) all require different types of pattern discovery. For visual queries to be useful, a problem must first be cast in the form of a visual pattern that, if identified, helps solve part of the problem. Finding a long, red, fairly straight line on a map can show the best way to drive between two cities. Once the visual query is constructed, a visual pattern search provides answers. As a first approximation, there are three types of memory: iconic, working, and long-term. Iconic memory is a very short-term image store, holding what is on the retina until it is replaced by something else or until several hundred milliseconds have passed. Visual working memory holds the visual objects of immediate attention. The contents of working memory can be drawn from either long-term memory or input from the eye, but most of the time information in working memory is a combination of external visual information made meaningful through the experiences stored in long-term memory. Long-term memory is the information that we retain from everyday experience, perhaps for a lifetime, but it should not be considered as separate from working memory. Instead, working memory can be better conceived of as information activated within long-term memory. Of the three different stores, working memory capacities and limitations are most critical to the visual thinking process. Experiments showing that we can hold three or four objects in visual working memory required intense concentration on the part of the participants. Much of the information we think we are perceiving externally is not external at all but is contained in the gist already stored in our long-term memories. So, in an instant what we actually perceive consists of a little bit of external information and a lot of internal information from long-term memory. We are seeing, mostly, what we already know about the world. As visual information is processed through the visual system, it activates the long-term memory traces of visual objects that have previously been processed by the same system. The long-term memory contains the information that we build up over a lifetime. We tend to associate long-term memory with events we can consciously recall, this is called episodic memory. 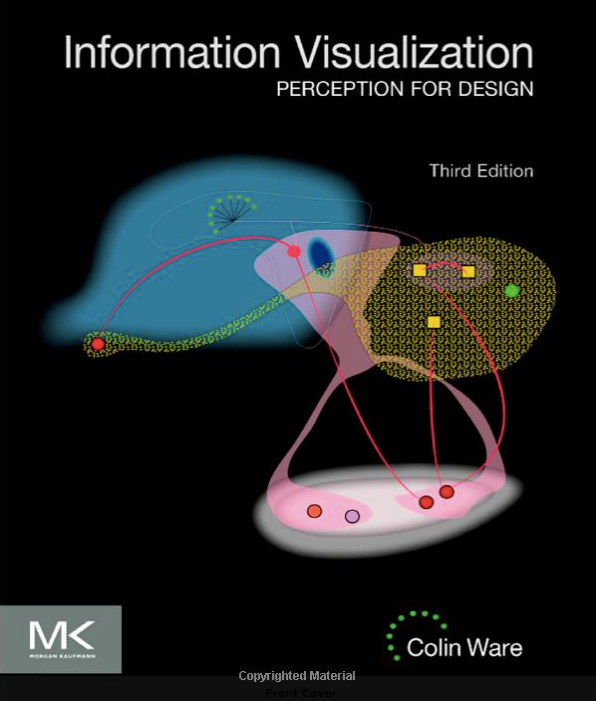 Grab a copy of the Information Visualization book. P.S: Please help others learn the art of creating good visualizations by sharing this post.